In fluvial systems the flow of water is a dominant and characterizing variable that influences diverse aspects of the stream environment (Hart and Finelli 1999). It affects channel shape and substrate composition and episodically disturbs both. 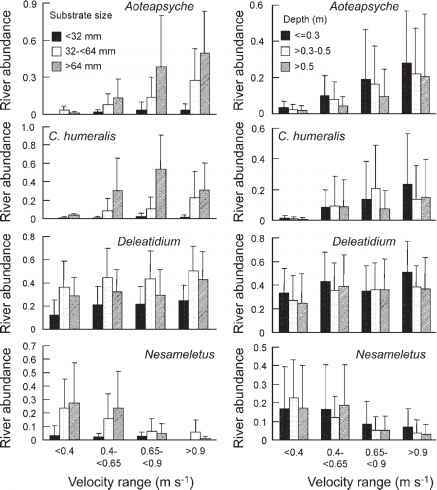 Flow strongly influences the physical structure and hydraulic forces operating in the benthic and near-bed microhabitats occupied by much of the biota, and is important to ecological interactions, rates of energy transfer, and material cycling (Figure 5.2). Current velocity is a direct physical force that organisms experience within the water column as well as at the substrate surface. Organisms are directly affected when eroded from a substrate or as their energy reserves are depleted by the work of maintaining position. They are indirectly affected when the delivery of food particles, nutrients or dissolved gasses influences their metabolism and growth. 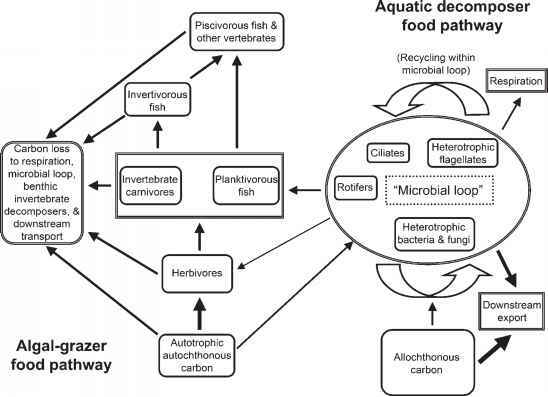 Flow conditions are important to ecosystem processes through the delivery of nutrients and gases and removal of wastes, and possibly by influencing which species occur at a site. Definitions and methods of measurement were given in Chapter 2; recall that current is the speed of moving water (usually in cm s 1 or m s_1), and flow or discharge is volume per unit time (usually m3 s 1 or cfs). smooth, laminar flow conditions, friction with the streambed results in a laminar sublayer of viscous flow very near the channel surface. In most natural circumstances, however, roughness-induced three-dimensional flows and turbulence characterize the near-bed environment where most stream organisms dwell (Hart and Finelli 1999). Characterizing near-bed flows creates an enormous measurement challenge and has led to a number of imaginative attempts over the past several decades to estimate or directly measure flow microenvironments. Approaches include application of boundary layer theory (Davis 1986, Vogel 1994); classification of flows and depths, and size and spacing of roughness elements (Davis and Barmuta 1989, Young 1992); predictions based on hydraulic engineering models (Statzner et al. 1988); and improvements in direct measurement at fine scales (Hart et al. 1996, Bouckaert and Davis 1998). Despite increasing sophistication these efforts have met with only partial success. Before discussing each in detail it is useful to introduce some language and equations pertaining to the velocity conditions and forces associated with flowing water.